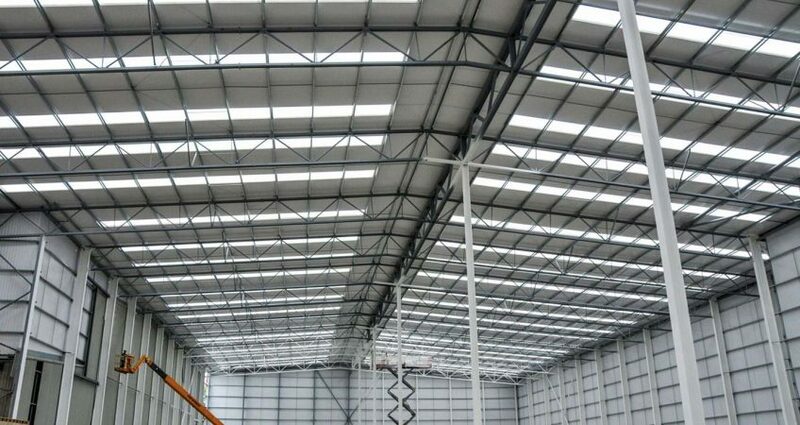 Regardless of whether your warehouse is simply for goods storage or used as a more active work environment, maintaining the integrity of the roof is essential. This is both to ensure the safe storage of your goods and the health and safety of workers. Whether you are constructing a completely new roof or refurbishing an old roof, you should be aware of the materials used in construction. Warehouse roofing is commonly made up of either composite or Twin Skin Roofing systems as detailed below. Composite roofing is probably the most commonly selected system used for warehouse roofing and cladding. It comprises of a pre-assembled roofing structure with insulation and support sandwiched between the upper and lower roofing panels; and can easily be fixed and assembled to construct the roof. It is essentially the same materials as a Twin Skin system (described below), but the main difference between the two is that Composite is supplied as a ‘ready to fit’ product; making it quick to install. This is the main attraction of Composite roofing as reflected by Sage BEC’s (formerly Sage Roofing) example at Farmfoods, Solihull where a 4000m2 Composite roof was laid and installed in one week. The pre-packaged system ensures thermal insulation & robustness to waterproofing, with a standardised guarantee on all fixings offered. The Twin Skin Roof is similar to the Composite roof in the respect that the same materials and products are generally used, but generally speaking this option is the cheaper of the two in materials costs. What you may save in material costs, however, may be accounted for through labour costs as it is a slower installation process than the composite roofing; as each layer has to be installed separately. It does offer the flexibility to the Building owner of selecting the thickness of the insulation they require, and they can hand select the specific top layer of their choice. There may also be instances for refurbishment jobs whereby the twin skin roofing proves to be the better and cheaper option for the job; or alternatively a composite roof may not offer the flexibility of choice for a particular new build design. Both of these options have their benefits, but which system is used is based upon analysis of particular factors and requirements of the job. Both of these systems are offered by a variety of different suppliers; and which system you select depends entirely upon the specific requirements of the roof. Sage BEC (formerly Sage Roofing) will assess each individual project and design a roofing system which offers the best quality product available at the best price manageable. We are approved contractors for many quality suppliers, however we are not exclusive to just these products allowing us to find the best possible roofing solution and price for our clients. Get in touch with our team today.